As one of the largest suppliers and manufacturers of stairs, staircases and stair parts in the UK, Pear Stairs has a large range of stair stringers for your staircase. What is a stair stringer? A stair stringer (also called ‘string’ or ‘stringer board’) is the housing on either side of a flight of stairs, into which the treads and risers are fixed. A staircase will have two stringers, one on either side of the steps. If one edge of the flight sits flush against an adjacent wall, the stringer that connects the treads and risers to the wall is referred to as a ‘wall stringer’. Staircase stringers may be manufactured to ‘house in’ or hide the edge of the stairs from view, or cut and mitred to the shape of the stairs so as to expose the tread profile. Different types of stair stringer? We can supply staircase stringers in a variety of different styles and materials. We sell pre-made stringers, which are available in the sizes specified in the descriptions below. Alternatively, we can manufacture custom to your specifications, ensuring compatibility with your staircase design. Our standard closed stringers are designed to ‘house in’ or hide the edge of your stairs from view. We sell pre-made standard stringer boards to 32mm thickness and 244mm height. These are available in 2.4, 3.6 and 4.2m lengths direct from our online shop. We strongly recommend using stair stringers of a minimum width of 32mm, as anything less can result in squeaky treads in your staircase. Cut stringers are cut to the shape of your stairs to display the side profile of each step. We sell pre-made FSC certified cut stringers for outdoor use. These are treated for weather resistance, and are designed for use with the exterior decking and accompanying stair fixings available in our . Pre-made interior cut stringers are not available to order although we do manufacture them as part of your staircase design, manufacturing them to suit your stair measurements and in your preferred timber. Thanks to the expertise of our experienced staff, we can even produce curved stringers where required, for use with curved staircases. A type of cut stringer which incorporates a decorative outside bracket, as well as showcasing the side profile of the stairs. We don’t stock pre-made cut strings with brackets in our online shop. Get in touch with our design team to discuss the type of outside bracket you might want – we can produce brackets to our standard design (pictured), or to a design specified by you. Alternatively, you can opt for a cut stringer without an external bracket. Routed stringers (sometimes called ‘box stringers’) are a type of staircase stringer which has been ‘routed out’ (‘hollowed out’) to incorporate notches into which treads, risers and wedges can be inserted. It then acts as a supporting joist for each tread. Routed stringers can be used to increase the ease of staircase installation. Only closed stringers can be routed. Stairs installed using routed strings are sometimes called ‘housed and wedged’ stairs. Sorry, custom and pre-made routed stringers are not available except as a complete staircase. To take a look at the staircase stringers that we currently have available, please take a look at our vast to see our full range. You can also take a look at our free staircase design tool to see what the different stringers will look like on your staircase. What Is A Staircase Stringer? A staircase will have two stringers, one on either side of the steps. If one edge of the flight sits flush against an adjacent wall, the stringer that connects the treads and risers to the wall is referred to as a ‘wall stringer’. Cut Stringer Or Closed Stringer? We can supply staircase stringers in a variety of different styles and materials. We sell pre-made stringers and can also manufacture custom stringers to your specifications. The two main forms of stringer are closed stringers and cut stringers. Closed stringers are designed to ‘house in’ or hide the edge of your stairs from view. We sell pre-made standard stringer boards to 32mm thickness and 244mm height. These are available in 2.4, 3.6 and 4.2m lengths direct from our online shop. We strongly recommend using stair stringers of a minimum width of 32mm, as anything less can result in squeaky treads in your staircase. Cut stringers on the other hand are cut to the shape of your stairs to display the side profile of each step. As with many of our stair parts, stringers are available treated for external installations. These cut stringers are supplied in lengths of 1m for 3 steps, or 1.6m for 5 steps, manufactured to 48mm thickness and 260mm height, and are produced to a 35° pitch (the angle of the stairs from top to bottom). Pre-made interior cut stringers are not available to order although we do manufacture them as part of your staircase design. Thanks to the expertise of our experienced staff, we can even produce curved stringers where required, for use with curved staircases. We can also produce cut stringers with brackets. These stringers incorporate a decorative outside bracket, as well as showcasing the side profile of the stairs. We don’t stock pre-made cut strings with brackets in our online shop. Get in touch with our design team to discuss the type of outside bracket you might want – we can produce brackets to our standard design, or to a design specified by you. It then acts as a supporting joist for each tread. Routed stringers can be used to increase the ease of staircase installation. Only closed stringers can be routed. Stairs installed using routed strings are sometimes called ‘housed and wedged’ stairs. Sorry, custom and pre-made routed stringers are not available except as a complete staircase. To take a look at the staircase stringers that we currently have available, please take a look at our vast on-line shop to see our full range. 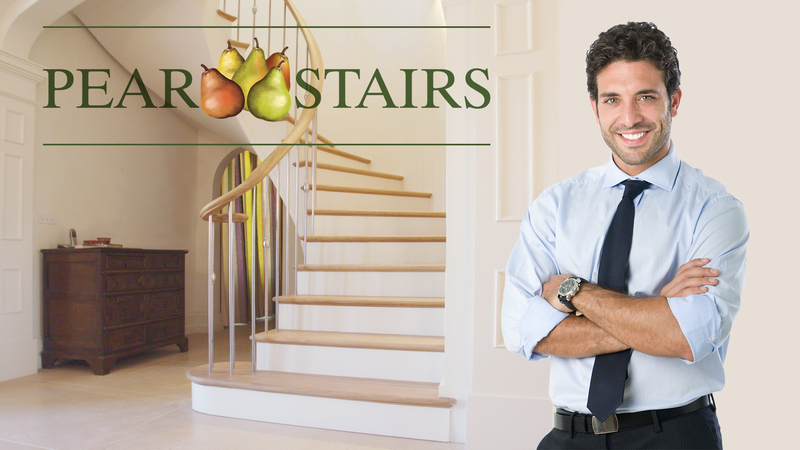 PEAR STAIRS BRINGS QUALITY STAIRCASE DESIGN TO THE HEART OF YOUR HOME. Along with the benefit of bespoke designs, we also offer great value for money. Our experience has allowed us to hone our craft, making our staircases affordable without sacrificing quality. In addition to providing complete staircases, we also offer a vast range of stair parts and staircase accessories. With our stock you can easily renovate your staircase and give your property that extra value. Updating the handrail with newel caps, designer spindles, a bespoke profile or one our boxed handrail kits can add an elegant flourish without breaking the bank. Or you could even apply some of our quality products to the garden, our choice of outdoor balustrading and decking can give a luxurious touch to your outdoor space. We have a proven record of providing flawless staircases for a variety of different projects throughout the UK, suiting the styles of each individual client.